With a 103 degree reading Seattle hit a record high today; the highest temperature ever and nearly 30 degrees above the historical average high temp for the date. Locally, things were even toastier: Redmond hit 107 and North Bend 113. The Microsoft Golf League play went on as scheduled however so I got to enjoy two hours in the late afternoon sunshine chasing golf balls. At least I finally had a good league outing, shooting my best score ever: 41 on the Eagle’s Talon front nine. It also turns out that July was the hottest month ever with an average temp of 69.5 degrees. My golf handicap index got to my personal low: 14.2. It’s a bit mysterious to me just how. I’ve had my least consistent year ever. One day I’ll have a shot a breaking 80 and the next day I’m floundering at 100. So while the low handicap is nice (while it lasts) I’d prefer to be more consistent each time out. I clearly remember July 20, 1969, the date of the first lunar landing. It was a Sunday and I spent most of the day making tossed salads and shrimp cocktails at Dolly & Joe’s Restaurant lamenting that I was going to miss the live TV transmission of man’s first step onto the moon while I chopped lettuce and sliced carrots. I did have a small transistor radio on the shelf above me so I could listen to events early that afternoon. I was thrilled when I realized that the astronauts had several hours of preparation after touchdown before they would step out onto to the lunar surface. So I was home and in front of the TV well before Neil Armstrong stepped into the lunar dust at 10:39 pm. I’ll never forget that grainy, black and white image–it’s still a thrilling memory forty years later. This weekend we finished installing an updated section of fence along the back corner of our property. It’s the area the pesky elk repeatedly broke through this past winter. Now it’s set up with eight-foot high 4×4 posts set in 120 pounds of concrete and steel wire fencing. During our three days of work an interested observer was this little doe who munched contentedly on the blackberries looking, I’m convinced, for potential weak points in our new defenses. 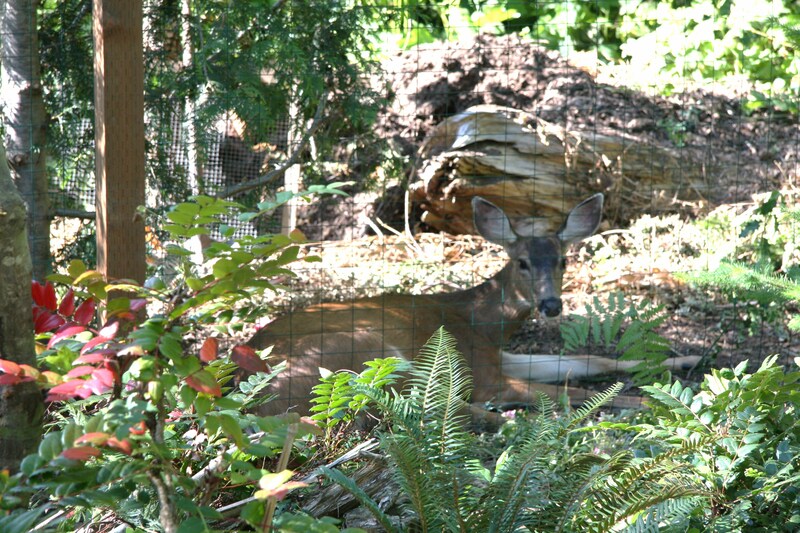 Late Sunday afternoon I found her lounging in a shady spot adjacent to the new fence snacking on some volunteer sedum. My golf group headed back to Gold Mountain again for two rounds and a yummy lunch. The day started out in cool showers, quite a contrast from the summery weather of Friday through Sunday. The rain cleared out midway through the morning round and by afternoon we had sun with blustery winds. I had OK rounds with a 90 on the Olympic course and 94 on Cascade.